Attention Moms and Moms to Be: Babes & Babies Event is the Place to BE! Moms and moms-to-be are invited for a day of shopping, education and information! Shop from 65 designers and companies offering baby and toddler clothing, accessories, gear, toys, resources and much more…all at discounted prices. Enjoy speakers and seminars run by DayOne Center, gift bags, plus a raffle with prizes worth over $7k including strollers from Stokke and 4moms! Kids are free and can enjoy play spaces, activity tables, life size playhouses and a dance class. The event will be held on Sunday, April 15th from 9:30am – 2:00pm at the St. Mary’s Cathedral, Patron’s Hall (1111 Gough Street @ Geary). Admission is 2 for $8 at appelandfrank.com or $5 each online or at the door. Kids and parking are free. Look out for the Golden Curly Tail table at the Babes and Babies Event….We’re excited to be part of this amazing event. This is the next event we’ll be at. 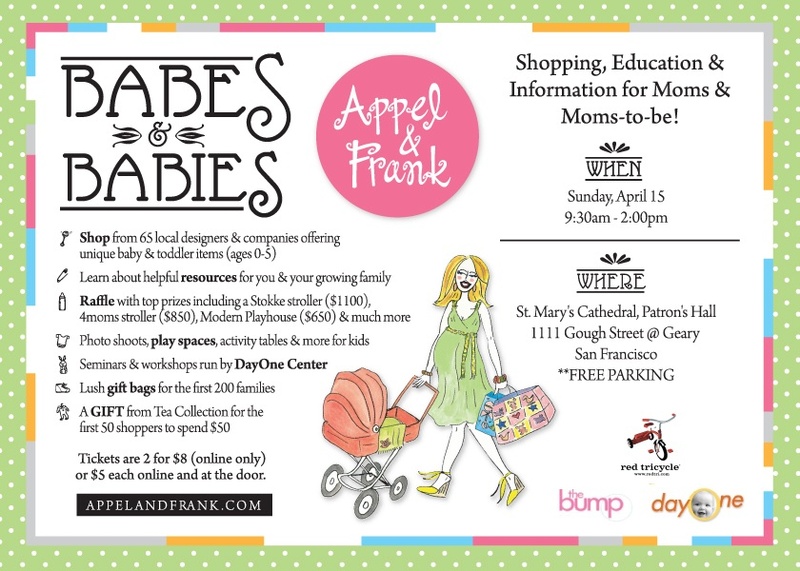 We are excited to be one of the 65 local designers and vendors at this upcoming Babes and Babies event, hosted by Appel & Frank! Shopping, Education & Information for Moms and Moms-to-be!